My list of books I still have to read – even those already on my shelves – is huge. As such, I do my very best to not re-read things if I can help it. However, last week a friend of mine – the psychologist – requested a new book to read and asked if she could borrow something off me, my choice. As I trawled the shelves for something really worth sharing, I came to the conclusion that I loved practically every book I own, but for many of them I can’t remember why. Reading a lot is great, but unfortunately I lose a lot of the minutia after a certain amount of time. I remember loving a book, or crying at it maybe, or even just being haunted by it, but I seldom remember the exact details of what caused that. It was when I was staring at my bay of Douglas Coupland novels that the feeling became particularly pronounced. Coupland, I will always say when asked, is one of my favourite authors, but as I looked at the thirteen books of his on my shelf, I realised that I hadn’t read one since 2011 and that the exact reason for my love of him had vanished. That had to change. As such, I intend to now read a Coupland novel once a month or so until I’ve re-read his back catalogue. And I’ll be reviewing them again, because reading this has reminded me why I love him and how much I love him, and I want to be able to share that with you, and maybe encourage you to explore his work. So, this is Generation X: Tales of an Accelerated Culture, his first novel, the one that made his name and helped define an entire generation. The titular generation are those people born between the early 1960s and early 1980s – in short, the offspring of the baby boomers. Coupland didn’t invent the term, but he sure as hell made it popular. This is the story of three friends who have dropped out of the real world and are living in the Californian desert, slumming it in dead end jobs and avoiding the horror of responsibilities and yuppies. They are Andy (the narrator, with two dogs and six siblings), Dag (obsessed with nuclear annihilation and prone to damaging cars for fun) and Claire (wanting to live like Andy and Dag, but still pining for her sometimes-lover Tobias), and they live a relatively simple life. They enjoy telling each other stories, and it is these stories that make up the novel. We meet other friends of theirs, Tobias the yuppie and Elvissa the mystery, who also have their own stories to tell. The stories are usually slightly fantastical in nature, or somehow involve the end of the world. In fairness, not a huge amount happens, but it is a wonderful patchwork quilt of interior monologues, apocalyptic scenarios and the power and joy of storytelling. The book discusses the difficulties of growing up in a world that has been pissed on by the previous generation. 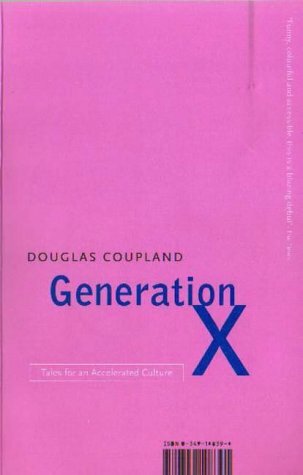 I’m not one of Generation X, I’m from Generation Y, but a lot of the themes are similar to things that I’ve experienced. It’s one of those books that creeps inside your brain and lodges somewhere uncomfortable just behind your hippocampus and makes you occasionally think a little bit too deeply about what you’re doing with your life and where it’s going. This is not necessarily a bad thing – it is just what Coupland has the power to do. He builds a complete scene, not only always using the perfect metaphor or similie, but by populating the scenes with food, products and names from the era that mean it can only be set in that one place. The book also includes quaint little cartoons and slogans, and definitions for new terms that sum up experiences that most of us have from now on. Probably the most famous one of all, which is now in fairly common usage, is “McJob”, defined as “a low-pay, low-prestige, low-dignity, low-benefit, no-future job in the service sector. Frequently considered a satisfying career choice by people who have never held one.” Some of my other favourites are below. Survivulousness – the tendency to visualize oneself enjoying being the last remaining person on Earth. Black Holes – an X generation subgroup best known for their possession of almost entirely black wardrobes. Mental Ground Zero – the location where one visualizes oneself during the dropping of the atomic bomb; frequently, a shopping mall. Douglas Coupland is so in touch with the zeitgeist that he’s all but clairvoyant (not my line, stolen from another review of his later book Generation A), and his books are a beacon of genuinely great literature. Sure, the general theme seems a little depressing, and the characters are lovely but seem to have little of any real value going for them, but there is an underlying current of hope throughout, a sense that everything will be OK in the end, and that to really enjoy life we need to stop worrying about money and success and just seek solace in the little moments, like watching egrets and lighting candles. The book harks back for a simpler time, but knows that it’s never coming. Coupland’s position as one of my favourite authors is reaffirmed. I can’t wait to re-read the rest.